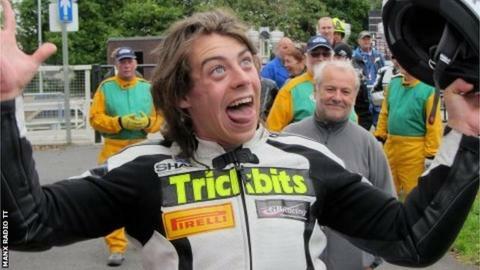 Northern Ireland's John Simpson has won the Senior Manx Grand Prix race in his debut year at the Isle of Man event. Simpson averaged 106.526mph in wet conditions to claim a two second victory over newcomer Andrew Soar. Simpson said: "I can't believe I've won - it hasn't hit me yet. The conditions were changing every lap." Wayne Kirwan, who won the Junior race on Wednesday finished 3.84 seconds down on Soar, having led by 50 seconds on the final lap. Second placed Soar said: "I can't believe it. I want to thank my dad my brother and the whole team. It's amazing." Earlier in the day Michael Dunlop and Roy Richardson claimed victories in the Classic Superbike and Junior Post Classic races.